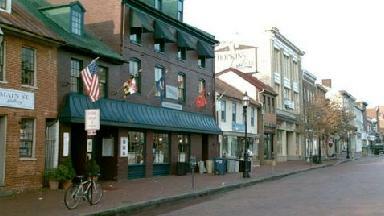 Any dining guide to top cuisine in Annapolis MD would have to include the good restaurants along West Street. One would expect to find seafood restaurants among the restaurants in Annapolis since so much of Annapolis revolves around its location on Chesapeake Bay, where crabs and other types of seafood are plentiful. 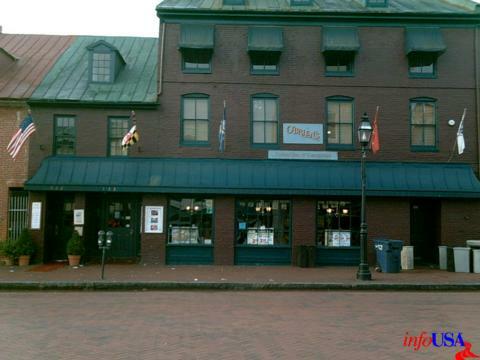 But, a traditional seafood restaurant or fish restaurant is far from the only choice available in Annapolis. 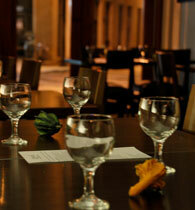 The city is modern and diverse and the restaurant menus reflect that. Located in the Loews Hotel, the Breeze has only 58 seats. Its simple, modern elegance warrants business casual attire. The menu features local products from the nearby waters and farms. The top cuisine prepared by its award winning chef includes crab and lobster pot pie at $27 and grilled pork loin with caramelized apples and brandy sauce at $22. Small plate options are also available at dinner. At lunch, prices are slightly lower and sandwiches are available. Dessert choices include hazelnut mousse and passion fruit crème brulee. 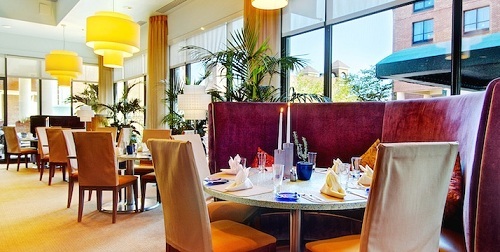 Breeze is not a typical hotel restaurant. 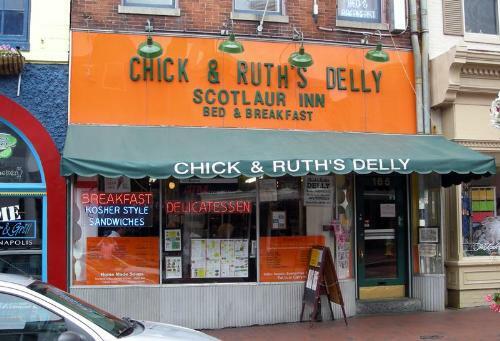 Although open daily for breakfast, it is closed for lunch on the weekends and for dinner on Sundays and Mondays. There are many options close by on West Street, however. Open seven days a week from 4:30 PM to 1:30 AM, Level is a romantic casual lounge, complete with exposed brick and candlelight, serving small plates ranging from cheese selections to salads, soups, pizzas and light entrees. 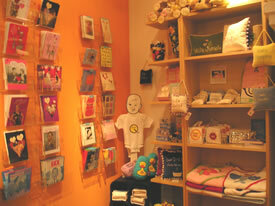 Sharing and combining is encouraged so a wide variety of tastes can be experienced in a single visit. Prices run from $4 per wedge of cheese to $12 for hummus with chipotle-agave nectar. Homemade seasonal desserts present a few surprises. Warm chocolate chip cookies are served with chocolate milk. Black ale is served with vanilla ice cream as a beer float. Sorbet can be paired with a New Zealand ice wine. There is a wide variety of wines, liquors, liqueurs, specialty cocktails and even house made spirits on hand. 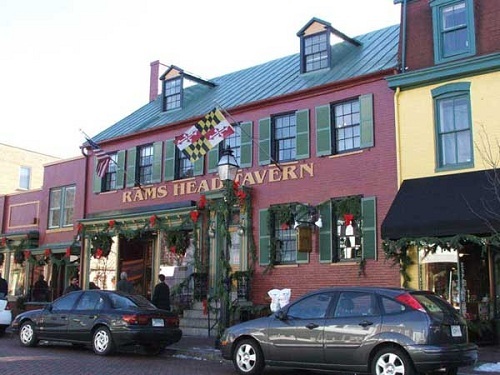 The Rams Head Tavern offers not only food and beer and ale selections but also live entertainment. 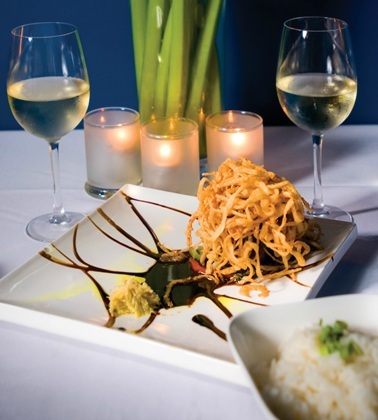 Its seafood choices include traditional Maryland crab cakes. Angus beef is served as is a grilled steak with apple chutney and sweet potato fries. 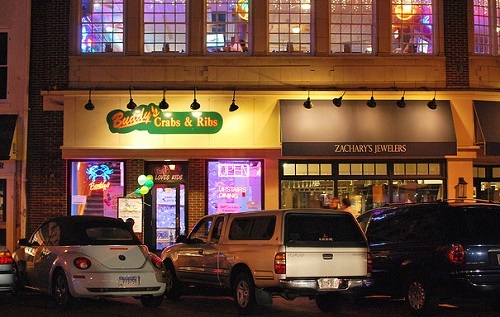 Sandwiches and salads are also available at this comfortable casual tavern where prices run from $6.95 for a bowl of cream of crab soup made from Maryland crabs to $29.95 for a Delmonico rib eye steak with shrimp and crab meat béarnaise. Another of the good restaurants along West Street is Tsunami. 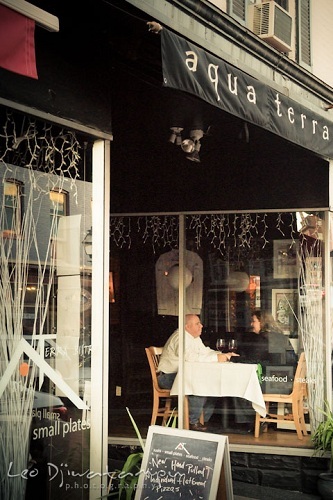 This trendy, dark, casual restaurant is as loud and lively as the tidal wave its name evokes. Open for lunch on weekdays and for dinner nightly, its sushi bar remains open until 1 a.m. Tsunami offers food with a Pan Asian fusion twist, including a wide selection of sushi choices as well as meat and seafood options. Prices for main dinner entrees are from $18 to $33 while the unique sides are extra. Sushi servings run from $4 to $10. Kobe beef sliders are $14 and strip steak with Hoisin sauce and fries is $18 at lunch. 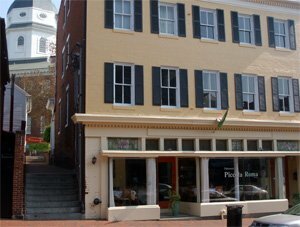 So, while a seafood restaurant or a fish restaurant might be expected of restaurants in Annapolis, and seafood restaurants do abound, we hope this dining guide of restaurant menus can make everyone happy in Annapolis MD. West Street has a pretty new face—several of them, in fact. Once a major eyesore of ramshackle buildings and down-on-their-luckers, West Street has undergone a major nip and tuck. And it looks mahvalous. A short stroll from the Naval Academy, and the Main Street and Maryland Avenue shopping districts, West Street has morphed into a hip and happening ‘hood. Until the makeover began a decade ago, the turf belonged largely to prostitutes, drug dealers, and lost tourists searching for City Dock. To drive down the street was to risk eviscerating your buggy’s belly or disappearing in a pothole bigger than Peoria.